I had seen a YouTube video making actual Lissajous patterns with sand falling from a pendulum with 2 different periods and looking in the Wikipedia page the looked very easy to simulate. 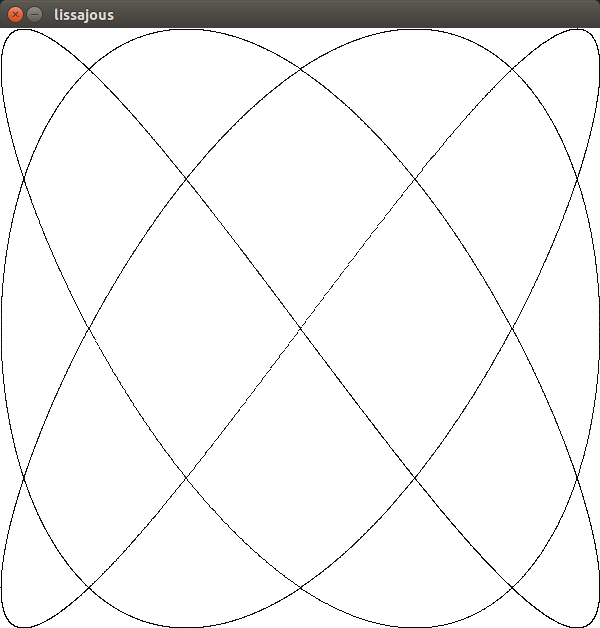 I made a Processing sketch simulating such a pattern. Here is an example output with a = 3, b = 4 (the same as the third Wikipedia example). float a = 3; // x "relative importance"
float b = 4; // y "relative importance"
I kept the names short to match closely the Wikipedia specification, and added a short comment near them. Is this best practice? I have quite a few related variables. Should I encapsulate them into a class (maybe LissajousSimulator, with a single function updateState)? Or would that just be over-engineering? If it's obviously copied from somewhere without changing anything then it's perfectly fine to not change anything to the code itself. Given that you also have the link to the (pseudo-)code. In this case I wouldn't even add comments other than: look at this page to know how it works. If however you want to integrate it better into your own code to treat it like it's actually part of it then there's no reason to keep the code as close to the original as possible. If like you say there are a number of variables and methods that are forming a coherent group then you should put them into their own class. For your new class you'll have to find out what to put in the class and what methods to provide. I also made the horizontal and vertical scaling factors constant inside the class. This was just as an example. If you want to be able to change the size of the figure as well it's obvious that you want these as variables that you can pass through constructor or setters instead. Not the answer you're looking for? Browse other questions tagged graph simulation processing or ask your own question.